How long it will take for a VA to be integrated into your business is like asking ‘How long is a piece of string’. 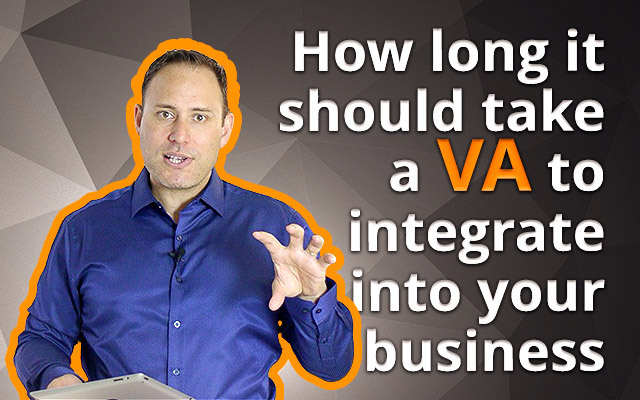 This all changes if you understand the 5 basic rules of integrating a VA into your business. Hey, David Judge here and today we’re going to talk ask ‘How long should it take to integrate a VA into my business. We’re going to look at this from a few different angles and really break down the different areas you should focus on, also including a few tips on the best ways to achieve that integration!!! In some ways when you employ a person the length of time it takes them to integrate into your business completely, is similar to asking ‘how long is a piece of string’ as every business is different and while a lot of tasks may overlap, there will always be a few little unique tasks that will take time for your outsourcer to pick up. With that in mind, you can fairly quickly tell if a person is going to be there for the long haul based on their first few weeks of working with you. Whilst these first couple of weeks will help gauge if they feel like a good fit for your business in order to integrate a person fully, within the shortest period of time then there are a few rules you need to follow. In the early days although I was aware, I never enforced this rule and as a result had many issues with clients not feeling as if they were getting value from their VA. When I changed my process to ensure we were looking at the tasks and processes at the very beginning it was a complete flip around with the Business not only getting value, they also had a plan to follow on the tasks to outsource. This is exactly the same as getting a team member locally, where you need to invest a little time to help them to understand your business. You can invest the time personally or have one of your existing team do it for you. This will also help flag any gaps they may have in their knowledge allowing you to ‘nip them in the bud’ and correct right away. If you follow the first rule, this makes this stage really easy to set up as you’ll have a plan to follow. This rule makes it a lot easier to understand a VA’s progress and ability also helping the VA to feel like they are making process with their integration into your business. The way I handle this Rule is to set up weekly goals and objectives outlining the tasks to complete, along with the overall purpose of that task. I use Google drive to do this and at the beginning of the new week we look at the previous week and reflect on the tasks that weren’t completed and why. We can flag an issues at this stage and also discuss any tasks that weren’t up to scratch and what we’ll do about them. Finally, we congratulate the tasks that were completed well and use those as a guide for the next steps. Lack of communication ends marriages, starts wars and can prevent your VA from reaching their full potential. It’s really important, especially at the beginning that you actually over-communicate to ensure you’re outsourcer is integrating well within your business. This can be via email, instant messaging services like Skype or my personal favourite… talking to each other. You can ‘talk’ to your VA again by using Skype and if you’re really tricky you can add credit to a Skype account and a phone number (which can be set to your local area) and ring them up from your mobile when you’re on the go. We’re not in the 50’s so it’s ok to openly communicate. If you’re not getting the results you’re after you can throw your hands up in the air and run off crying, or… you can look at the result you’re getting and adjust what you’re doing to suit the integration of your VA. There will be times when you may need to change small parts of how your business works to fully integrate that person into your business. I have many instances of clients that have gone through this process with the actual correct and adjust process helping their business to go to the next level in many other indirect ways. This is all as a result of correcting and adjusting how they do business. Ok, that’s it… 5 Rules to follow and based on the use of those 5 rules I’ve found it takes about 2 weeks for you to truly understand if a person will be able to integrate into your business (call it a ‘gut feeling’) and about 4 weeks in total for them to 80% integrate into your business. Lets’ wrap up. In the next session we’re going to talk about Work hours and holidays with your VA. What holidays are there, what time should you allow to take off and what are the best hours for your VA to work in your business?